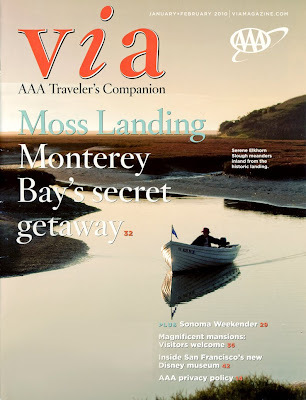 A few months ago I headed down to Monterey on assignment, to capture a cover for Via magazine (AAA’s travel publication). Millions will see the image on the cover of their January/February 2010 issue (their circulation being one of the largest of any travel magazine in the US), and most won’t bat an eye at how I came to capture the image. Which is fine. That’s my job as a photographer. And just as we past hundreds of buildings everyday, most don’t think about all that went into erecting that structure. I know, I said erecting. I digress….into an 11-year old boy. But seriously, if you’re curious how I came to capture the shot, here are some of the details. I was first hired in September to go down to the Monterey area, to come back with a mix of images for an article on Moss Landing and the Elkhorn Slough– from antique shops in the small town, to a famous seafood dish at Phil’s Fish Market, to a mix of wildlife and scenes in the largest tract of tidal salt marsh in California outside of San Francisco Bay. I went down a bit early on a Friday (set to shoot Saturday and Sunday) and found beautiful sunset light with a group of 250 sea lions who had taken over a local pier- captured some fantastic shots. But with the weekend came the fog and overcast that didn’t let up. So I photographed as well as I could (although my editors were hoping for blue skies) and came back with a variety of images, albeit in soft white light. I wasn’t sure I’d be given a second chance with the weather, but a month later my editors asked me to return searching for clear skies and a clear cover choice. On a beautiful blue sky Sunday morning, the day after Halloween, a warm-streak came through Northern California, normally reserved for the indian summers of early October – yet this one was spilling over into November- a rare occurrence only Al Gore could explain. As I drove back to the Elkhorn Slough, I prepped the day in my mind – half of it spent hiking the eastern side of the slough capturing birds and wildlife, the other half in a small boat on the water. I clicked off a mix of scenes creating natural blinds to hide and document bird life in the area. Around 2pm, I headed to meet a very nice gentleman who agreed to take me into the slough on a 1950s russian rescue boat – a local kayak company owner. I only had a couple of hours left of light (due to the early late fall days) and hoped to find a sunset scene with a person and the surrounding worthy for the cover. It was a wonderful few hours photographing sea otters resting in kelp beds, the Elkhorn Slough Safari taking visitors through the area, Pelicans silhouetted by the sunset, as well as the full moon rising as kayakers headed out for a nighttime paddle. But I wasn’t sure if I had the cover. About 45 minutes before the sun set, we headed up a small inlet hoping to find still waters and a nice scene to frame. We came to an old pier and a bend in the waterway, and I knew we had something. I stepped off the boat and had my new friend navigate the small vessel up and down the way as I fired shot after shot. It was a peaceful serene scene that felt right. Hopefully many will like the shot, maybe it will inspire some, and thankfully my editors were pleased with the image choices from the shoot – which is always my first goal when I’m on assignment. You rarely have a scene you feel should be the cover, actually become the cover – but this time the weather, my boat captain, my eye and my editors all came in line. I'm a 23-year commercial photographer, author (The Complete Guide to Nature Photography, The BetterPhoto Guide to Exposure, as well as numerous articles), photo expert, industry personality, and all around nice dude based in the San Francisco Bay Area of California.